Scooters are big in my neighborhood. You could say I’m one of the cool (22 y/o) kids. Also pictured: pup. It has some bad overspray on a rattle can paint job, some weird stickering going on, but I don’t a garage/shed/cover and I’m going to beat on this pretty hard. No rust for now, and I plan on getting a waterproof cover for where it sits on the apartment complex bike rack. Uhh... it’s the same as the outside. Wait! There is some under-seat storage. You can’t fit much there though. It feels peppier than my old 2008 GY6 scooter, but who knows because the speedometer doesn’t work. I might try to source a new one, but who cares when it’s full throttle all the time anyways. 2-stroke motors have an advantage in both hp/liter and smelling great. I don’t know if this is worse than it was new though, considering it is 8 years older than me. Not bad, but I have a feeling that’s more attributable to the desire to keep the shiny fleshy side up. Better than the ride in my dad’s mini. It doesn’t have one. It does have a lever I have to hold down while I pedal in order to get the engine going, but I don’t know what to call it. Simple is better right? The previous owner did an LED light upgrade which takes this from outright dangerous to borderline irresponsible to drive at night, so kuddos to him. The horn still works so, uh, that’s a thing too. I’d like to see anyone get a solid commuter thing for less than $500, never mind the low running costs. I will have to invest in a bike cover, new license plate mount (possibly put it on a cargo box), possibly some speedometer parts, and I might retrofit some blinkers for convenience/safety’s sake. MPG: Probably pretty good, but who keeps track at a gallon every so often. 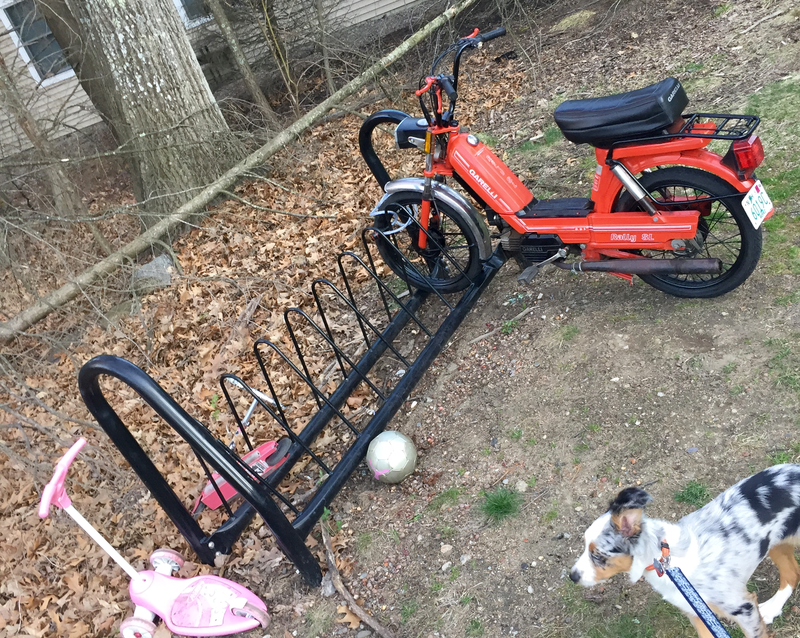 I’m hoping that others will join me in wrenching and riding on some vintage pedal-motor-things, so I will continue to write about and video my journeys on it. What do people want to see? Mountain mopeding? Grocery getting?